Florida is a known bird-watching capital of the world and, thanks to a new book and its accompanying movie, one of those birds is in the spotlight. The new book, entitled ‘Hoot,’ portrays a struggle surrounding Florida’s burrowing owls. It was written by Carl Hiaasen, author of over twenty books including other kids’ books like Flush, Chomp, and Skink and adult fiction books like The Downhill Lie, Skin Tight, and Native Tongue. 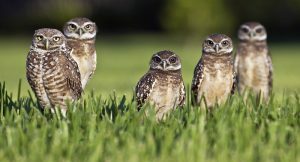 The book ‘Hoot,’ tells the story of three kids trying to save a family of burrowing owls from developers’ bulldozers. While the movie didn’t score so well in theaters, it came back nicely on DVD. Its environmental message provided the disappearing burrowing owl some rather needed attention. 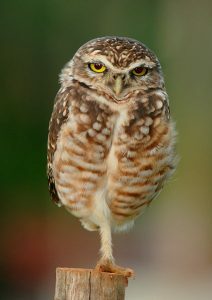 Burrowing owls range from Canada down to South America but only west of the Mississippi, with one notable exception, Florida. Burrowing owls live underground, as the name implies, usually borrowing the already-created burrows of other subterranean wildlife like gopher tortoises, gophers, armadillos, and other common burrowers. The species has seen a decided decline without an obvious smoking gun to blame. Many point to loss of habitat as the main reason, but according to the Saskatchewan Burrowing Owl Interpretive Centre, some less obvious reasons may be to blame. They point to the significantly decreased numbers of burrow-creating animals, a mid-level position on the food chain, a slow breeding cycle, food sources contaminated with insecticide, and a reduced availability of food in general. 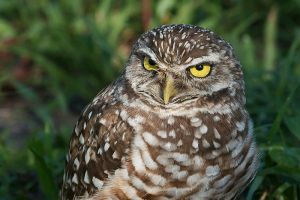 For those interested in ecotourism, an article by photographer Mia McPherson describes a few ways to help the burrowing owl. The simple solution she provides is to view and photograph the owls at a distance. While attention to the species is a good thing for its conservation, it can lead to problems. Simply walking overtop of their burrows can collapse them and kill the owls. Going too close their dens can also scare the owls off, potentially abandoning a yearly nesting site. McPhersoon suggests that allowing the animals a respectable distance is more important than gaining a preferred, up-close view. The movie, ‘Hoot,’ is set in Florida, a sandy terrain well-suited for easy burrowing. Florida is also home to the endangered gopher tortoise, which prefers habitats unfortunately identical to those ideal for housing. Gopher tortoise dens serve well as burrows for the owls. Regardless of the reasons why the burrowing owl, with its pronounced brow and intense eyes, has declined, the rise of the DVD sales for the ‘Hoot’ movie may gain the species a welcome spotlight.